This eye-catching curtain waterfall is fed by powerful submersible pumps. We deal with all sizes of equipment from large cascade and stream pumps through to filter, fountain and small water-feature pumps. 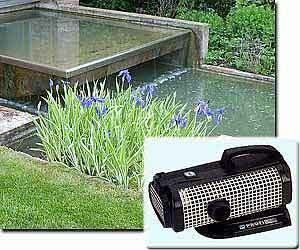 Moving water adds life to any garden, with soothing splashing and reflective ripples. We use quality brands for longer pump lifespan, reduced maintenance and lower running costs. The ideal pond is clear and lucid, with crisp reflections and transparent depth. With careful siting, design and planting, many pools can achieve this appearance for much of the year with only routine maintenance. In more challenging situations, especially if there are greater stocks of fish, will will fit an appropriate filter system to ensure clean and healthy water. The larger model shown above is for medium-large ponds and can be sited some distance from the pond if that helps to hide it. It has an automated screen to pre-filter large solids from the water, so reducing the frequency of cleaning for the main filter media. 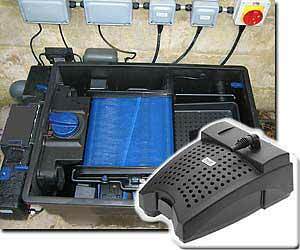 The smaller model is an unobtrusive, submersible, all-in-one unit for use in the smallest water features. Various other units are available for those ponds of intermediate size. On specialist koi ponds where the highest quality water is required we can use appropriate sieve units, bead-filters, drum screen, and/or moving media filter units to suit. We fit other ancillary equipment too, such as UV units for green water control, surface skimmers for sparkling reflections, and air-pumps for additional aeration. 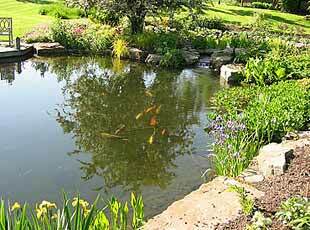 On the largest ponds we specialise in the design and fitting of natural plant filter beds. One was fitted to the 130,000 litre pond above during refurbishment, and it overcame the previous cloudy water problems as well as improving the water quality for the substantial collection of koi. Very large ponds are often more complicated to treat with ‘off the shelf’ filter units. Instead, we can design filter beds carefully matched to each pond, and use a combination of specialist aggregates and flow rates, sediment removal facilities, and selected water plants to purify the water and give reliable long-term results with low maintenance. We supplement with UV units where appropriate.